Roulette is known to be the game of chance. Indeed, there is no ways of predicting the game outcomes. Nevertheless, there are some adheres to the idea that adjusting the roulette bet amounts, the player can control the overall outcome of the game. However, can the betting systems really insure the possibility of winning over the lost in best online casino games? Let's review some of the roulette betting systems a bit in detail. This system, for example, is mostly used for even-money bets. For instance, the player may use such system in the case of black or red, even -odd, low-high. According to the Martingale system, the payer starts from certain bet amount. After each lost, the player doubles the wager; each time he wins - goes back to the original bet. Thus, the theory states that the player cannot lose every spin. Sooner or later, the player is to win. If that happens, the player surely gets a kind of compensation for each lost spin and accumulates the small profit. And so on, on and on. The point is that no matter, how often the player loses, he will certainly win in the end. The drawback in this system is that in real world of best online gambling the bets cannot be doubled indefinitely. 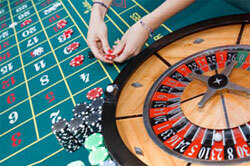 Hence, each of the roulette tables has its own betting limitation. Moreover, every player has his bankroll limit. By doubling, the player is more likely to get into the money hole and lose everything. Another roulette betting system widely used, alongside the above-mentioned, is called the Labouchere betting system. According to it, the player must employ some very basic mathematics. Not everyone is capable of this job. From the very beginning the player decides, how much he wants to benefit during the game in the current session. For example, the player decides to win 20 dollars. After that, the player writes random positive numbers that are to be equal 20, the amount of wished outcome. In the case of 20 it may be: 1,2,4,1,1,2,6,3. It is important for the player to pick the first and the last numbers, put them together, and bet this very amount on the table, where the odds of winning are the highest. Thus, it may be for the roulette black or red, odd or even, second half bet or the second half bet. If the player wins after the betting, he crosses the two numbers off and passes over to the next. And so on. After all the numbers are crossed off, the player gets his wished remuneration. However, this system has its drawbacks. The player risks to have a large unrecoverable loss of casino bonus that may cause the total failure in game. That is why this method is not effective, though some experts consider it more adequate than then the previous one. This system is suitable for even chance bets, for example, black or red. It is aimed at finding a balance of two chances. It states that at some particular period of time there are equal number of losses and wins. The player choses a start wager above the house minimum sum, but not so high to be able to raise it and increase. When the bet wins, the bet amount is reduced by the increase amount and vice versa. This system allows stopping its operation at any time and accepting a win.